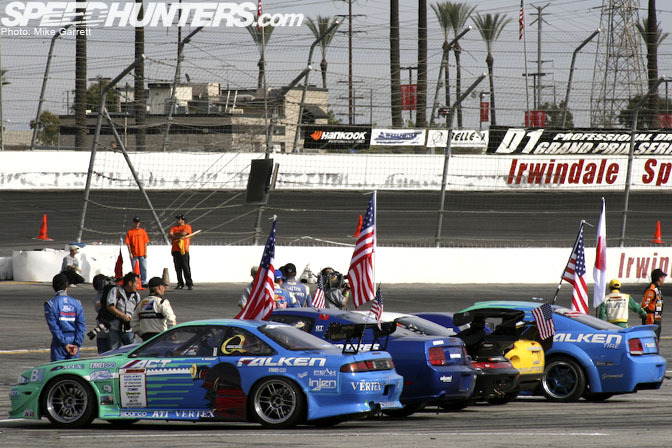 As part of our look at SoCal this month and in the lead up to the this weekend’s Formula D closer at Irwindale Speedway, we will be taking a look at some of the past drift events held at “The House of Drift”. Antonio’s collection of Irwindale material spans a lot more years than mine, but I am going to take a look back at the D1GP event weekends from 2006 and 2007. It’s a shame that D1 has not held any stateside events this year and we can hope they will return sometime in the future, but for now at least we can nostalgically look back at the events held in the past couple years. OK, so one and two years is not that much time, but both of these events were quite memorable as they gathered all of America and Japan’s top drivers as well drivers from countries all around the world. After the 2005 USA vs. Japan All Star Match where Vaughn Gittin Jr. drove his Mustang to America’s first ever D1 victory, plans were to made to take things even further and host a “world all star” event the following year which would add drivers from other countries besides the US and Japan. In addition to this world all star match, the event would also include the for-points season finale of the 2006 D1GP season. 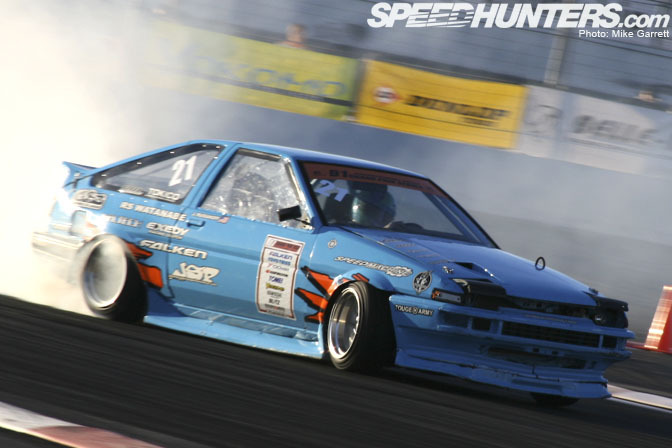 The ’06 season closer brought a number of interesting cars from Japan including Wataru Haysahi’s AE86 Levin, Daigo Saito’s JZX100 Chaser and Yoshinori Koguchi’s JZX100 Chaser. At this time I had not spent too much time around Japanese drift cars and I vividly recall how cool it felt to see these JDM-spec machines as they sat togeher in the Irwindale infield under the setting sun. You can also see Hiro Sumida’s veteran “zombie” JZX90 Chaser peeking out from the right side of the photo. 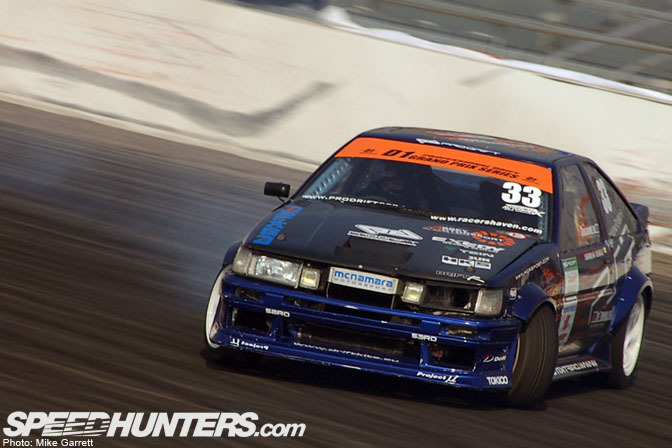 The 2006 event marked Darren McNamara’s stateside debut and at this time he was still driving his SR20-powered AE86 Levin. I remember being very impressed by the high level of skill and aggressive driving style he displayed while driving on Irwindale’s unfamiliar and tricky course. You might remember the tough fight he put up against Nomuken during the tsuiso rounds. I guess Darren liked driving in the US and soon after this he became a Formula D regular. 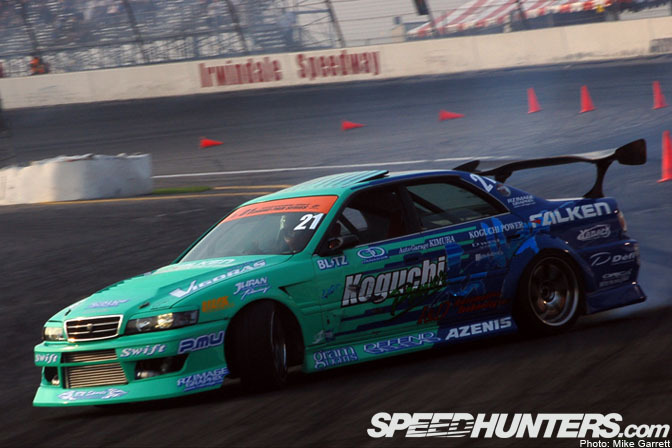 Yoshinori Koguchi drove his Falken-colored JZX100 Chaser during the 2006 event before switching back to his trusty 180SX for 2007. As you might remember from the story about our visit to Koguchi Power, the Chaser is currently sitting outside of his shop in a non-running state. Heading into the ’06 season finale Nobushige Kumakubo was in a very tight race with Nomuken for series championship. I cannot recall the exact numbers, but it was a single digit margin separating the two of them. Nomuken would end up being eliminated before Kumakubo, which secured the ’06 title for Kuma. Kumakubo then advanced to the finals where he was defeated by his teamate Kazuhiro Tanaka who earned his first Irwindale victory. Kumakubo’s championship win and Tanaka’s event win made it a big night for Team Orange. Although Nomuken was set back by his loss of the series championship, the weekend was only halfway over. He was able to come back the next day and drive to victory in the World All Star match which helped him end the ’06 season on a high note. 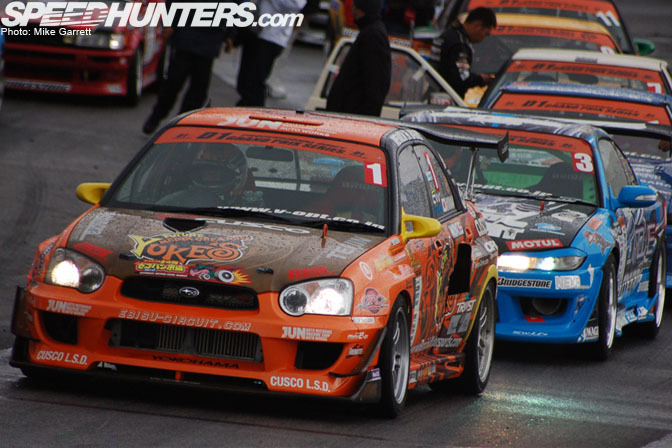 For 2007 the event would not be a D1GP points match, but the World All Star portion of the event was expanded to include a lot more international drivers. A veteran of both the 2006 and 2007 all star events is Malaysian driver Tengku Djan who put in impressive performances in his AE86 Trueno. Here we see him shredding some Bridgestone rubber during the 2007 event. D1GP liked him enough that was invited to compete at this year’s Tokyo Drift event in Odiaba behind the wheel of a borrowed 180SX. It would be cool to see D1 invite more international drivers to its Japanese events as I’m sure Japanese D1 fans would love to see foreign drivers like Vaughn Gittin Jr. and his Mustang. Another driver seen at the Irwindale events was privateer John Russakoff in his S2000-AE86. 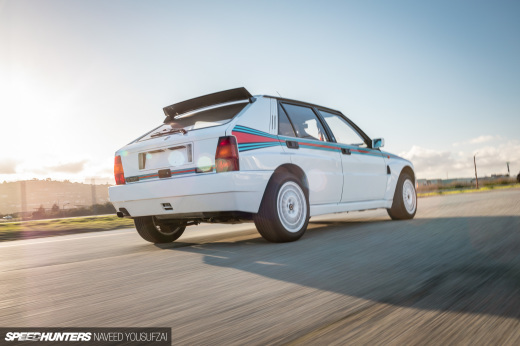 Competing without big sponsors can be very difficult, but John has more than made up for it with his distinctive and cool-looking car light blue car and his aggressive driving style that is always fun to watch. Fernando Wiehrl brought his S15 Silvia all the way from Australia to compete in the ’07 event. 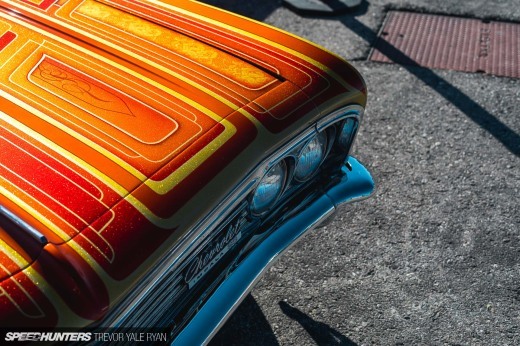 The car’s chrome-like finish and aggressive AME Circlar wheels made it one of the most eye-catching cars at the event. Some of the other international competitors included Robbie Bolger in his Holden Monaro and New Zealand drivers Adam Richards in his RB26 Cefiro and Mad Mike Whiddett in his FD3S. Another driver from New Zealand who appeared at the 2007 All Star event was JT Wharerau in his blue and white FD3S RX7. Like Darren McNamara before him, JT enjoyed his experience drifting overseas so much that he and his FD are now seen competing stateside in Formula D events this year. His fellow countryman Adam Richards now drives in the European Drift Championship. 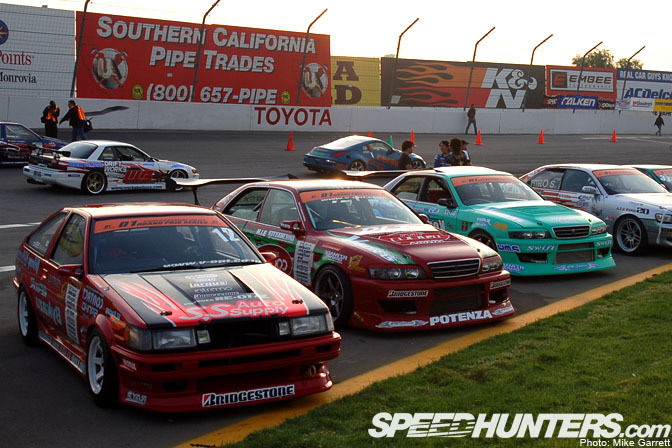 Apparently Irwindale Speedway has become the launching point for international drifting tours. Clash of the titans as Vaugh Gittin Jr.’s Mustang matches up with Kumakubo’s Evo9 during the special USA vs. Japan “dream match” that was held during the event. These are both drivers that have had a lot success competing at Irwindale over the years. Both would get their time in the spotlight during the 2007 All Star weekend. On Saturday night Kumakubo would defeat Atsushi Kuroi to take victory in the season finale exhibition match. At this point he had not been driving his new Evo for all that long, but he still was able to prove his title as the tsuiso king with the the win at Irwindale. As usual, there were plenty of people in the stands to watch the battles and make plenty of requests to the judges to see sudden death rematches. While Kumakubo won on Saturday Night, it was JR’s turn on Sunday. After narrowly losing to Kuma during the afternoon’s USA vs. Japan match, he came back to earn his second D1GP victory after defeating Kumakubo during the evening’s All Star World Championship. 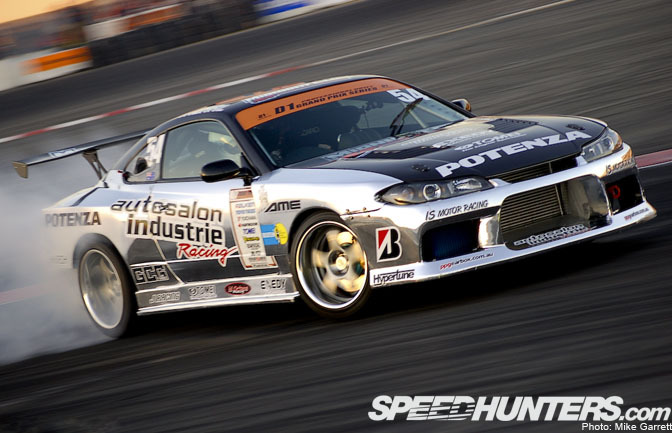 He remains the only non-Japanese driver to be victorious in D1GP event. 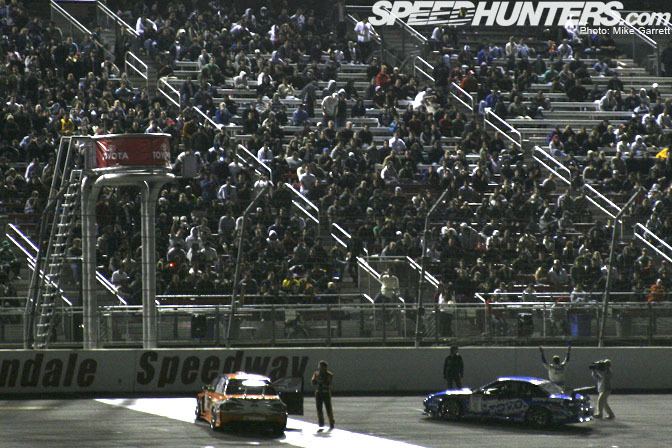 It was a fine way to end the ’07 season and hopefully that wasn’t the last time that D1 will run on the famous Irwindale course. While D1 USA events may be currently on hiatus, at least we can still look forward to the Formula D finale at Irwindale this weekend as well as next month when the inagural Red Bull World Drifting Championship in Long Beach will again bring the world’s best drifters to SoCal to duke it out. aw, I remember those events... It's neat seeing them from another perspective. This year Tengku Djan will be driving his SR22DET 180SX at Irwindale. the europeans stand a good chance this year, james deane,ben broke smith,eric o'sullivan and tim marshall all competing!